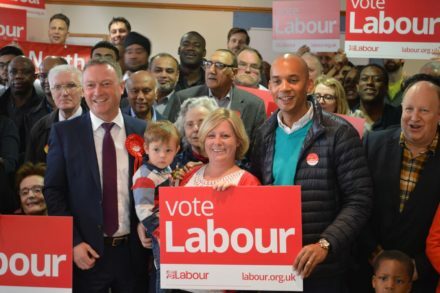 This is the speech delivered by Chuka Umunna at his count in Streatham last night. Can I start by thanking the Returning Officer and all the staff here who have run this count so well. One of the many things we have been reminded of these last few weeks is just how precious our democracy is. Elections are the essence of democracy. They cannot happen without your dedication and hard work, so thank you. And it’s fantastic to see the increased turnout here in Streatham tonight and across the country — particularly from young people. This is a culturally rich and diverse community; brimming with energy, talent and enthusiasm; full of hope and optimism for the future. But we have deep rooted challenges too which have been exacerbated by seven years of Conservative failure and austerity. This has caused appalling pain and suffering among the most vulnerable people here in Streatham and around the country. Theresa May broke her promise and called this opportunistic general election to gain a personal mandate for her plans for an extreme Brexit. There are still more results to come but the indications this evening are that the British people have fundamentally rejected her vision for Brexit and her negative campaign. We all recognise the clear result of last year’s referendum but I have always argued that nobody voted in that referendum to become poorer. Therefore we must remain in the single market and in the customs union. EU citizens here should have their rights guaranteed with immediate effect. And Leave campaigners like Boris Johnson and Michael Gove must be held to account for the promises they made. I want to pay tribute tonight to Labour activists, councillors and candidates who have worked tirelessly and with dedication. These results tonight are thanks to every single one of you. Tonight has shown the enduring strength of the Labour movement. In the face of a relentlessly negative Conservative campaign, an arrogant Prime Minster believing she had the result in the bag, and a vitriolic assault from parts of the media, we have united as a party and our positive offer has shone through. Labour’s optimistic, open and inclusive vision has contrasted with the Conservative’s miserable, closed and divisive approach. I also want to pay tribute tonight to Jeremy Corbyn. He has run an energetic and engaging campaign. This result has derailed the Tories’ plans to slash school budgets, cut the NHS, and pursue an extreme Brexit that would make Britain poorer. We are much closer to a Labour government than we were before this general election. In me, you will have a Labour MP fighting your corner every minute of every day here in Lambeth. So, I say to our supporters and activists who have worked so hard to elect a Labour government: thanks a million for your hard work. It is not clear this evening who will form the next government. Indeed, it may take days for that to become clear. But you have my guarantee that I will return the trust of my constituents and work hard to look out for your interests and fight your corner.